Today's post is in response to a recent reader request... "I have several dozen cassette tapes that I can't listen to anymore because I don't have a cassette player (does anyone?). Help! How do I convert them to digital format that I can play in iTunes?" While there are likely professional services in you area that will help you to convert these old tapes to digital format, they can get a little pricey, and I guarantee that unless you just have a couple tapes to convert, you'll spend more converting your library of cassette tapes through a professional than you would doing it on your own... and when you're done, you will own the equipment to do it again (or for someone else). In order to convert your tapes, you will need a few things. First, you will need something to play your cassette tapes on (a cassette deck, boom box, etc). If you don't have easy access to one, you may want to ask some of your friends or neighbors (hint: start by asking your older friends and neighbors rather than the newlyweds). Someone is bound to have an old tape deck laying around you can use. Next, you will need something to convert the analog signal into digital. 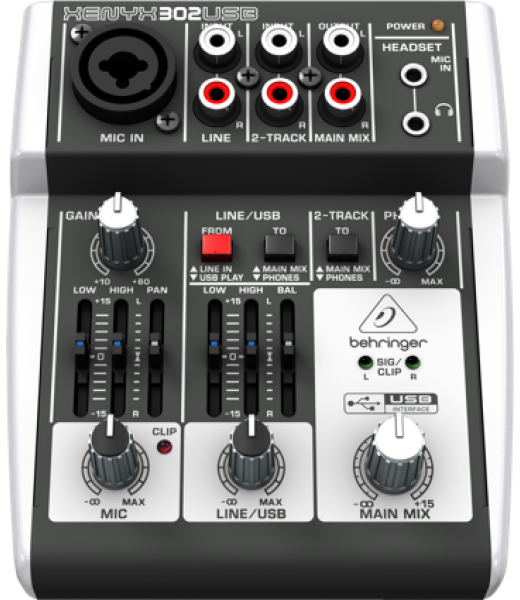 For me, that something is the Behringer XENYX 302USB 5-Input Compact Mixer. This little guy may look simple (and it is simple to use), but it packs a punch. You'll spend about $50 on it (depending on where you get it from, you may be able to get it cheaper), but it will be worth owning permanently. Not only does this device convert an analog signal into digital, but it has a few controls built-in that will allow you to clean up the audio as it's being captured. This is a very handy feature. Lastly, you will need software to capture and process the audio coming from the XENYX mixer. My weapon of choice is none other than GarageBand. It's a free app for Mac and does an amazing job with capturing and editing audio. When you have all three components, it's time to put them to use. Before you launch GarageBand, we'll want to connect our XENYX mixer. This will ensure that when GarageBand opens, it will see the mixer and automatically load the appropriate drivers and allow you to choose the device as your input device. If you want to change it later, you can go into your GarageBand preferences and select a different audio source. When you're ready, simply create a new GarageBand project, and begin recording. Once it has begun recording, begin playing your tape. Your analog signal coming from the tape deck will be converted to a digital signal (thanks to the XENYX mixer) and sent to GarageBand via the digital USB cable. GaragaBand will capture that audio and record it to the track. Once the track is done, simply stop recording. After you are done recording your track, you may want to do a little editing (such as trimming the excess fat off the ends of the audio track), so that it sounds great. This process of converting old tapes is great for converting more than just cassette tapes. It works great for old records, reel-to-reels, etc. The only difference is the device that the media is played on. Posted on June 9, 2014 by Kevin Allgaier and filed under Design, How To, Mac.